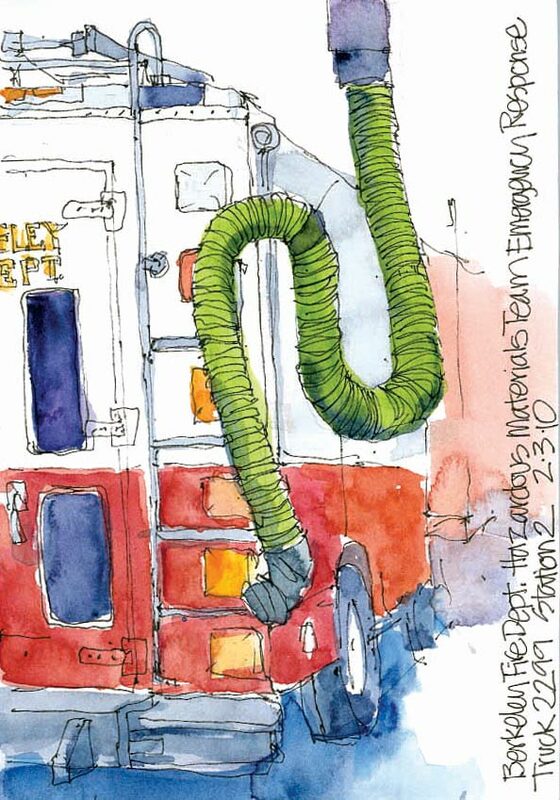 When we go on our Tuesday night sketchcrawls I learn so much from seeing how Cathy approaches sketching, with her years of experience and vision as a graphic designer. This sketch is a good example of the way she designs a page, including both the detail and the context, while connecting elements to the edges of the page. 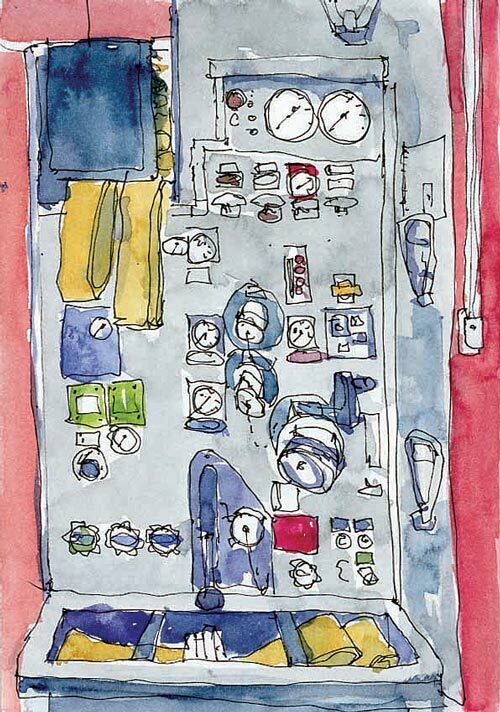 Cathy’s sketches often display groups of objects in interesting patterns. She also edits the subject to make a better composition, in this case removing a few jackets to simplify. She first draws a group of objects as one shape as in contour drawing and then adds the interior lines. 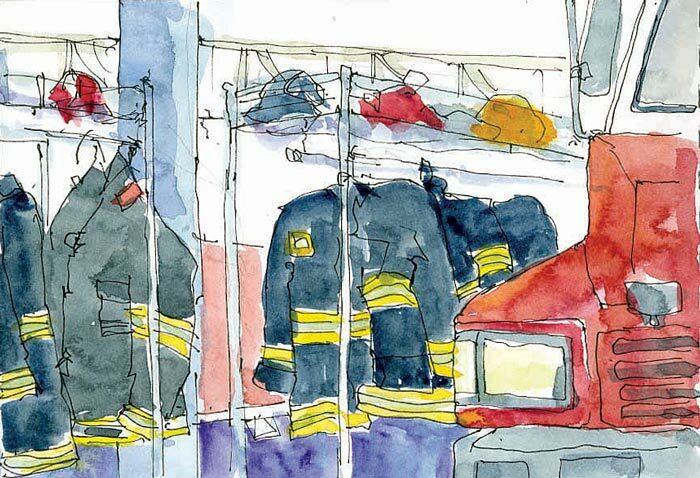 Again in this sketch above she shows the context as well as the detail, so that it’s not just a rack of jackets and helmets, but with the bit of fire truck you know they’re firemen’s jackets. Notice also her wonderful sketchy and free lines, which she achieves by holding the pen closer to the end than to the point. 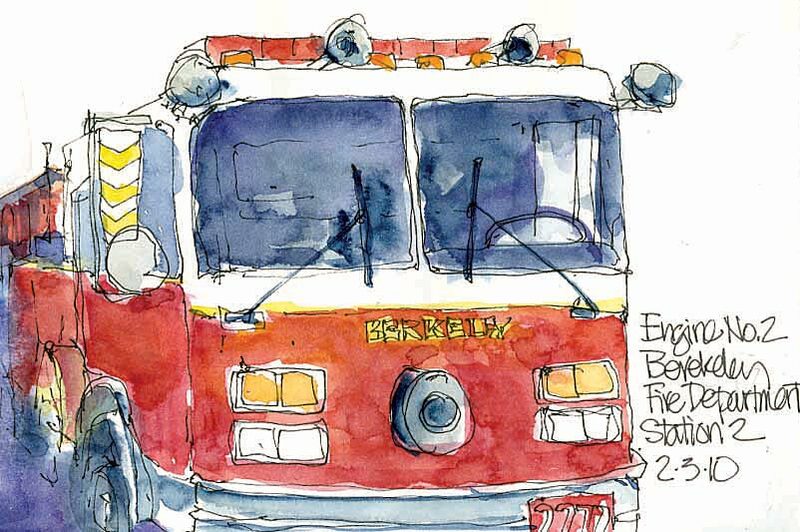 I love the way she got so much detail in the fire truck above but loosely, and with good perspective. Most of her sketches also include informative notes about the subject, placed in a location that adds to the good design. When I asked Cathy how she starts a sketch she said she always tries to start with the thing that interests her most to make sure it fits on the page and that it gets on the page. (It’s so easy to start drawing and run out of page before you ever get to the thing that attracted you first). More cool details: all the gizmos on the side of the truck. 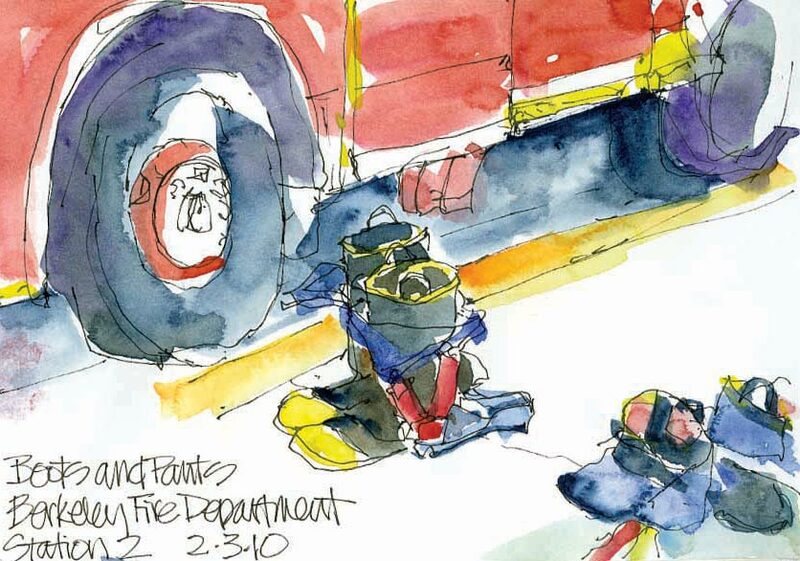 When she was sketching this (above), one of the firemen told her that when they are learning their equipment they also sketch all the gear and label it to help them study. Here’s her version of the ready-to-step-into boots and pants. Cathy sketches with ink in a spiral-bound 4×6″ Strathmore 400 Drawing notebook, focusing on making as many quick sketches as she can. She makes tiny pencil notes over the sketch about color to use when she adds watercolor later in the studio. All images copyright 2010 by Cathy McAuliffe, used with permission. She sketches with ink in a 4×6″ Strathmore 400 Drawing Paper pad, focusing on making as many quick sketches as she can. She makes tiny pencil notes over the sketch about color to use when she adds watercolor later in the studio. Thanks for sharing these pages, and your analysis of what makes them stand out as designs. While I sometimes sketch in public I am usually with others who are not drawing, and rarely have much time; I have not developed much facility in capturing what I see clearly. I like your comments about how she edits what she includes in the sketches, including only the most important details. Do I understand that Cathy isn’t using a bound sketchbook, but rather loose sheets in a pad? If that is the case, how does she keep them later? I updated the post to include a link to her sketchpad, which is actually spiral bound at the top. I used to use the same sketchbooks only a little bigger and liked them, despite the paper not being meant for watercolor. Love seeing the sketches from both of you. What a great place for a sketchcrawl! Thanks Shirley. It was a lot of fun, and I felt very privileged to be in the presence of such a wonderful team of men who all cared so much about their work, their service to their community, the care of their equipment and each other. By the way, I just received the two Diehl books you recommended, “Decorated Page” and “Decorated Journal” and they are absolutely fantastic! There are so many great ideas, useful information and tons of inspiration. Thanks for the suggestion. And I finally found a pen that is working on my watercolor paper: my Lamy Safari fountain pen is the only one that doesn’t seem to scratch and skip across the surface. I love both sets of sketches. 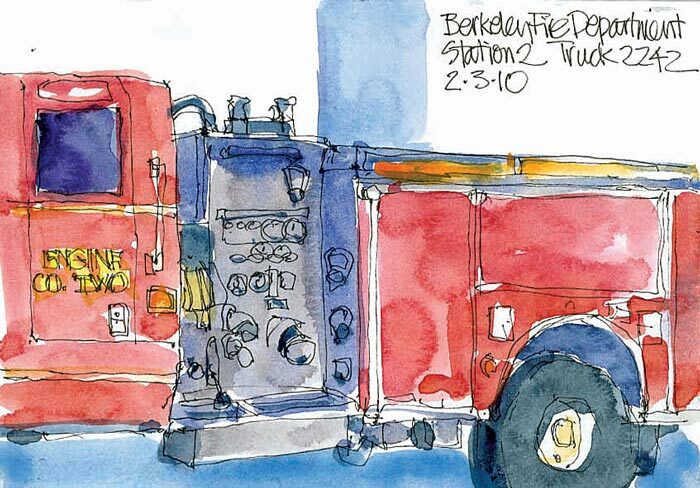 In the firehouse, I would panic from visual overload and end up painting one tire on one truck! LOL. What fun you both had. It’s great to see your differing styles. Thanks for including Cathy’s work and how she goes about her drawing. That sort of insight is often denied to others. She has such a lively style too! Thank you for sharing these. I like both your work and Cathy’s. Your notes on her methods were very informative. I’m trying to learn more about design and struggle with the numerous elements! Please keep these kinds of posts coming. Thanks.